June 14, 2012 — Caleb Tirado joins others at the Hickory Hill Aquatic Center participating in the World’s Largest Swimming Lesson. More than 100 kids joined 20 mentors in the local version of the simultaneous international event designed to set a world record while teaching youngsters to feel secure in the water. This was my first attempt in using a fish aquarium tank as a vehicle for getting my camera at the waterline of the pool to get a little more of an underwater experience. 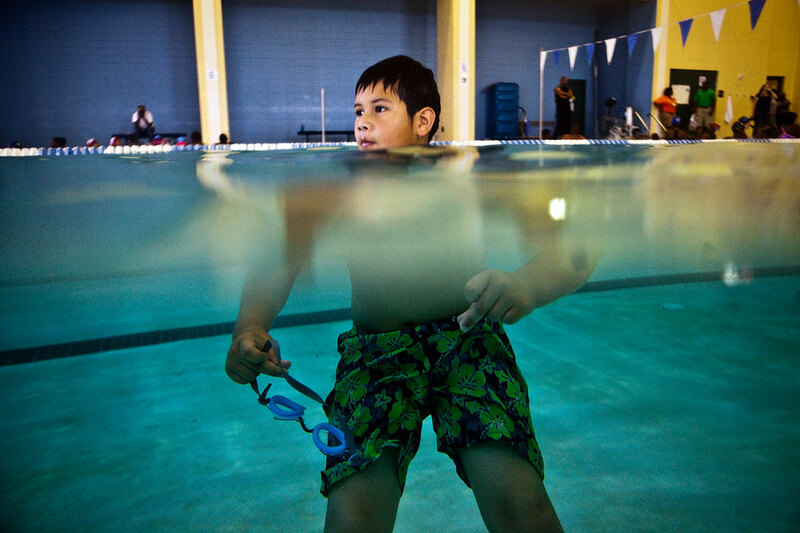 This is a more cost-effective way of capturing underwater moments. I spent $40 on a fish tank vs. $200+ on getting an underwater housing unit for my camera. It was a really fun challenge, but a little terrifying too. At one point, I overestimated the range I could submerge the tank and water did spill on my camera. Fortunately, I was able to jump out and dry it off in time. It was definitely worth the risk and something I will attempt again in the future, but I recommend being cautious and using back-up camera gear if you have one.